''I received my NATA score and i got a 128 and i can say that with all sincerity that i would not have been able to do it without the help that Umesh Sir and Shaun Sir gave me.Thanks a lot!!!!! The image banks, question banks and mock test were very useful to me and really gave me the confidence to tackle the difficult questions in the aptitude test. The feedback i got from Umesh Sir and guidance from Shaun Sir really motivated me and i saw a tremendous improvement in my sketching. Umesh Sir told me things that i would have otherwise overlooked like rendering, design principles and colouring techniques. be online tommorow evening, lets have a live session. You need to deepen the contrast and intensity of color in your sketches. practice shadows and shades of geometrical objects. answer the following question - draw rose plant in the size of a coconut tree and vice versa next to each other. submit it by tommorow. i have not got the cycle parts sketches submit them. 1. sketch a giraffe,an elephant and a zebra amongst the crowd as it would seem if they fled from the local zoo and were walking the streets with human beings. 2.Imagine u r at a lawyers cabin for discussing a case, but there's someone who wants to urgently meet the lawyer so he leaves the cabin for a couple of minutes...to pass ur time u luk at the wall behind his chair. On the wall are racks of books of similar kind neatly arranged, there is notepad, pen stand, telephone & and a few books from the rack on his table. Depict the scene how it will look from ur chair! 3.three cones.. inverted with a rectangular slab between them. Light is falling from the right side making an angle of 45 degrees. submit them by 20th April. 1- design a mural to be exhibited on a building exterior for delhi 2011 olympic games. 2 - design a stable composition using 6 candles 5 balls and 3 cubes. 3- imagine you are ant walking through a vegitable market. draw what you see. 2. design a 3d sculpture to be installed infront of an architecture college. 3. you are travelling in a busy city bus. draw what you see. Redo the 2d composition as per feedback and submit by end of today 12th April. Submit your sketches as instructed over live interaction by 12th April. 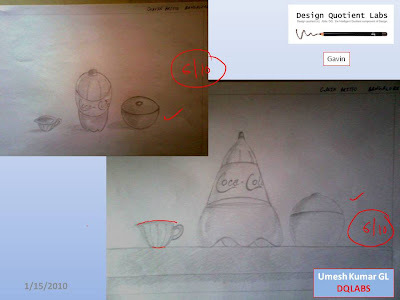 Correct your 2d drawing composition as per the feedback. lets meet today at 9:15 pm. i will give you feedback on other sketches over skype. Submit the drawings as instructed in the one to one visual classroom interaction we had today by 6th of April. the variation in color intensity has been lost in your recent coloring assignment. redo and try to get that wow feel in your colorings. submit the same by 22nd March. Good job. create 5 different 2 d composition using square, circle and a rectangle. use them in varying sizes and in required number of times. color them appropriately using hte color concepts. submit them by 8th March. Add depth to the sketches tht scored less marks. I have sent you new set of assigments, submit them by 15th Feb. Send better clarity scans, not digital photos. i have sent you new set of assignments. submit them by 8th Feb.
submit the new asssignment sent by mail, by 1st Feb. I have sent you new set of assignmens by email. submit them by 18th Jan.
Redo the assignment as per the feedback and submit them by 11th Jan 2010. I have sent you assignments by email. Submit them on 1st Jan 2010. you will get feedback by 4th Jan 2010.There are year end vacation for dqlabbs from 21st dec to 31st decemeber. you will get feedback of your sketches on 4th of Jan.
Dear Prateek, you need to enroll in sketch development course of DQLABS at nata.dqlabs.in to get the feedback and guidance. umesh sir.i wnt to persue my career in architecture bt i m unable to prepare for my sketching skills bcz of my trip out of staion...hw can i recover as soon as possible...plz recomend some coaching..
Hi Komal, join dqlabs and take up the online sketch assignments. you can submit them from where ever you are . all you need is a4 sheets, pencils and access to internet and your passion and enthusiasm...thats all. the learning process is very flexible and suits best for your busy schedule..
Umesh sir, i have an aspiration for being a architect, i have a good hand in sketches and drawings, want some rapid suggestions for upcoming NATA test. hello umesh sir,i m willing to pursue my career in architecture as i m very passionate about doing this,i find my self lacking in my drawing skills n human figure,can you just tell me how n what should i join dq labs,as i have enrolled in but still m not getting certain things,i wud be pleased to get ur help in drawing! umesh sir,i want to persure my caree im architectur bt i dont know whr to start from...? or talk to Shaun Sir at 9845288005. We shall definitely help you to improve your skills easily and quickly. Do not worry if you are interested in Architecture we will guide you thoroughly . Please email us your contact number to info@dqlabs.in or contact us on 09591001000 or 09900006282 to understand about course and career opportunities. sir , i m monika i m giving 2012 aieee b/arch exam as well as nata 2012 can u pls suggest me ur best package and it detail . pls i need ur help i wanna enrol today can u pls suggest me as early as possible .. and i m requesting u to pls give me 1 trial online class or demo class as by this i can know about u well ..
hello Umesh Sir , i am in class twelve and wiling to pursue my career in architecture but i am not that well in human figures and 3d drawing as well,i would be grateful to you if you'd help me in drawings. wat to do architecture or engg??? Hello Sir, which books covers the entire study material for NATA preparation? my name is gowri and i am in class 12. i am very interested in doing architecture but my drawing skills are not up too the mark. i have got ideas in my mind but don't know how to convey it through drawing .please help me. i would like to talk to you sir before i apply for this online course. please give me your email id. Sir, I am about to give my Class 12 boards, and I want to pursue Architecture. My drawing is good, I have done well in Intremediate and Elementary Drawing exams in Class 9. But still I want to sharpen my drawing skills, 3D skills and Coloring skills. Kindly help me out in it. And what about the career opportunities in this field? Hi Nilashri, please talk to us on 9591001000 for further information. Hello Umesh Sir, i am in class twelve and a NATA aspirant.I am not so good in drawing.I would love if u had helped me with this. Hello Umesh sir,I am in class twelve and is appearing for the NATA exam.I am not tht good in drawing..I would be glad if you help me with this. sir plz help me by providing right information regarding the steps to enroll into dqlabs..!! hello sir my name is madhura deo i want to do a career in architecture but i am unable to get questions nd if i get it i need some advice on 2d nd 3d designs m confused very much i love drawind bt whn i draw then its lacking something everytime please suggest something. hello umesh sir, i recently learned that black and white are not colours and that it is not advisable to use it during the nata exam..is this true? and also, more importance is given to shading or details in the perception question?? Hi Aishwarya, as i had discussed with you in the morning, please let us know the topics you are not confident with, we shall organise classes for you at indiranagar studio...All the best..
hello sir..im going to write NATA exam this year 2014 on the month of may . I would like to know whether we can use scale in NATA exam? will they object in examination centres ?